A collaborative venture between 14 people from the USA, Canada, Thailand and the UK. Steve Lee is a Senior Software Developer, who is uses various techniques for customising ‘off-the-shelf' software to meet individual accessibility needs. He is also interested in how Open Collaborative Communities can help and involve disabled people. 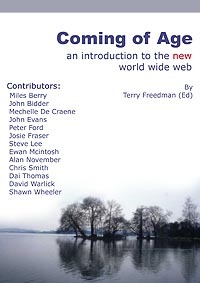 This booklet is (c) 2006 Terry Freedman (Ed) and its individual contributors. The following copyright statement applies to all chapters, unless stated otherwise. for your own personal, professional and non-commercial use. However, you may pass it on to others, either in its entirety or as individual sections; if you do so, please include acknowledgements to the source. You may not adapt, alter or create a derivative work from any part of the booklet except for your own personal, professional and non-commercial use, and on condition that you make it clear that the altered article is different to that accredited to the original author. written permission of Terry Freedman or the individual author.